The design team at doubleTwist has been creating Android apps for some time and thanks to Google’s consistency in design (finally) with Holo, the team is introducing the newly redesigned, doubleTwist Player. 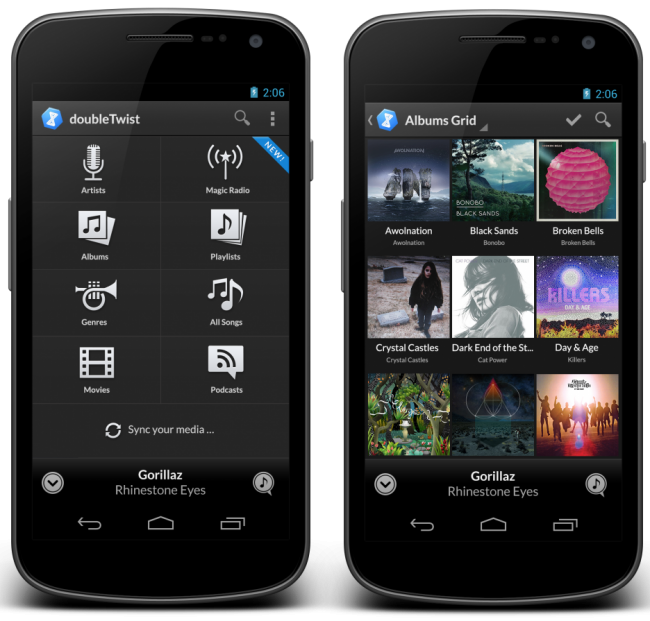 For some time, doubleTwist stands out from the pack of other 3rd party music players for its ability to sync iTunes playlists, legally download album art at high resolutions, plus allowing music lovers access to radio that features a library of over 13 million tracks. According to their blog, this is only “Stage One” in the process, which will bring new life to the aging player. We haven’t simply adopted Holo, but worked to incorporate everything great about Google’s latest and best designs to bring doubleTwist fully in line with their conventions and design patterns. We took a lot of care to balance the clean and crisp look of Holo with our own aesthetic and I think it turned out fantastic. Each page throughout the application has been redone, including the necessary artists, songs, albums, genres pages. In essence, it should feel and look like a completely brand new application. The update isn’t completely 100% live yet, but should be showing itself starting sometime today and over the course of this week for users.